Thanksgiving is right around the corner! I don’t know about you, but it’s never the turkey and side dishes that get me in trouble at Thanksgiving. It’s the pies, cakes and cookies that challenge my resolve (and my waistline). So, why not prepare a dessert that tastes rich and decadent, but will not give you a sugar-induced food hangover for Black Friday shopping? My Cranberry Sweet Potato Cupcakes are full of fall fun… literally. When you cut into the moist cinnamon sweet potato cake, you find an unexpected cranberry sauce center. I recommend eating this one with a plate and fork, because, while the cupcake looks sophisticated from the outside, it’s a beautiful (and delicious) mess on the inside! Add these cupcakes to your Thanksgiving dessert table, serve them the morning after with coffee, or make them ANY TIME you want to indulge your fall-flavored cravings! *Simple homemade cranberry sauce recipe included, but canned will work too. If you use a full-sugar canned cranberry sauce, it adds 4 grams of carbs (16 calories) per cupcake. 1) Preheat oven at 375 degrees. 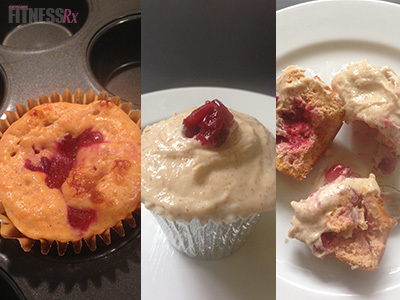 3) Blend all cupcake ingredients together except the cranberry sauce. 4) Spoon cupcake batter into the foil-lined cupcake pan, making sure to not fill any of the cupcake liners more than ¾ full. 5) Spoon about ½ tablespoon of the cranberry sauce* into the center of the cupcake batter. 6) Bake for 10-14 minutes, or until a toothpick comes out clean when you pierce a cupcake with it. 8) To make the icing, mix all the ingredients together in a bowl. Place in the fridge for about 10 minutes, so it can thicken and set. This is a critical step to ensure the icing is thick, not runny. (You can thicken the icing further by adding more protein powder.) Spoon and spread onto the top of the cooled cupcakes and garnish with a few cranberries or nuts. *To make your own cranberry sauce, bring 1 cup of water and 1 cup of Splenda Granulated (or a sweetener of your choice) to a boil in a sauce pan. Once boiling, add a 12-ounce bag of whole cranberries to the water and turn down the heat slightly. Continue cooking the cranberries for 10 minutes at a gentle boil. Stir occasionally. Remove from heat and poor into another bowl to cool. When starting a new nutrition program, there is often debate on whether we should abstain from eating our favorite “indulgences” or if we should just eat them in moderation. From my experience, this completely depends on the individual. If one taste is going to create crazy cravings, then you are likely better off as an abstainer. If knowing that you can have a little taste gives you a sense of control and ownership of your fitness program, then you are suited for the moderation approach. The key is to get real with ourselves. We must recognize patterns and weaknesses and adjust our diets accordingly. When we do, we’ll be one step closer to our best!